In the tradition of European Muralists, Kate McRostie’s style reflects the colors and textures of Tuscany, Normandy and Provence. Placing decorative icons on sophisticated backgrounds, her patterned brushwork evokes the texture of sun-worn damask. The combination of Kate’s artistic style with her ability to create collections related to current home trends allows for successful home décor and gift products sold by retailers around the world. 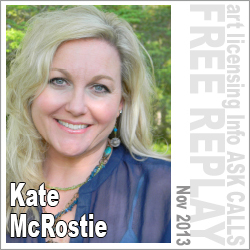 Kate shares her artistic journey and how it led her to art licensing. She also talks about bringing her sisters into the business, and how that division of labor and work environment works for her. In addition, Kate discusses trends, working without an agent, and the future of art licensing and retail in general.